The former island capital of Teguise, Spain, is Lanzarote´s time machine. As this is the spot where the Spanish conquistadores created their first official settlement in the Canaries in 1411. Creating a bridge head on Lanzarote before going on to subdue the rest of the archipelago. During the 16th and 17th centuries Teguise emerged as the islands affluent capital. Benefiting from the growing trade in slaves from Africa and Inca gold from the New World – as Lanzarote was used as an important trading post between Spain’s nascent empire and the Iberian Peninsula. This trade also attracted the attentions of numerous privateers however. Amongst them English heroes such as Raleigh and Drake. Whilst Algerian pirates also regularly raided the coastline and Teguise itself. Spilling blood on the quiet cobbled streets in 1618. When a Moorish armada disgorged 5,000 desperate buccaneers in the town. This cataclysmic event is still remembered on the island to this day – commemorated by a small street called "La Sangre", which means blood in Spanish. Teguise was named after the last Princess of the native pre-Spanish Guanche inhabitants and despite the pirate raids remained Lanzarote´s top dog until 1852. When this mantle was passed on to Arrecife. Its central position, high ground and commanding views making it the ideal capital. The rich trading heritage resulted in the construction of many sumptous mansions and palaces over the centuries. And today the town is a veritable treasure trove of colonial architecture. Much of which is accessible to visitors. Such as the main church, Neustra Senora de Guadalupe and the restored home of a wealthy 17th century merchant, The Palacio de Spinola. Which is now a fascinating house museum. Whilst the oldest building in the town – the Palacio de Marquez – dates back as far as 1455 and is reputed to have a tunnel connecting it to the Castillo de Santa Barbara which stands guard over the town from nearby Mount Guanapay. 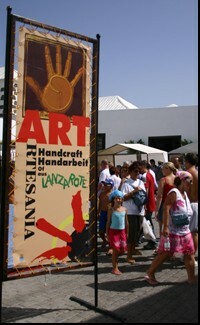 The quiet cobbled streets come alive every Sunday as the town plays host to Lanzarote´s largest weekly market. Which attracts locals and tourists in their thousands. 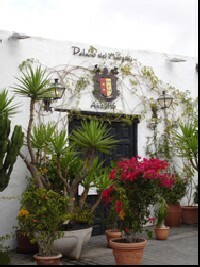 But the best time to tour the historic buildings and streets is during the week – when the town is virtually deserted and visitors can connect with a slice of the ‘real Lanzarote’. 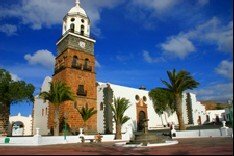 By Bus: Local bus services run to Teguise from the nearby resort of Costa Teguise and from the capital Arrecife. By Car Simple to reach by car the town is located just off the LZ10, which runs from Arrecife to the north of the island. And is approximately a 15 minute drive from the nearest tourist resort of Costa Teguise. This page was written by one of Unique Spains expert contributors: Lanzarote Guidebook who have recognised the importance of bringing first hand Unique experiences of Spanish heritage and culture to the attention of visitors to Spain.